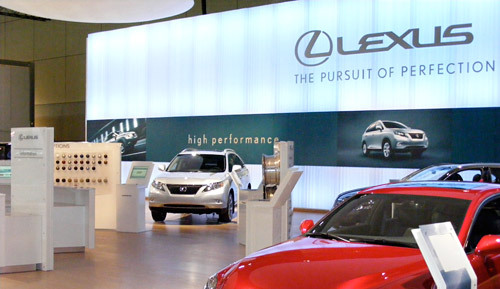 As I mentioned, I had an opportunity to talk with John-Paul Farag, Lexus Canada’s Advanced Technology & Powertrain Consultant, who answered some questions that have come up over the last few months. TPP: Where is the battery located on the HS, is it underneath the vehicle? John-Paul: It’s similar to the Camry, where it’s partially in the trunk and behind the seat, similar to that. With a sedan you’re limited to that area. TPP: I know that with the GS, from 2008 to 2009, there was a great reduction in the size of the battery. How was that accomplished? John-Paul: Aside from the actual chemistry of the battery, which we haven’t changed much recently — nickel-metal has proven to be very robust and very good in our experience — a lot of the packaging around it, the casing and the cooling has a lot to do with it. Where you place the cooling fans, or if there’s a number of different ones, can actually affect a lot of the size. The reduction was in the cooling, the packaging and the casing. And it’s not only the battery, the power control unit, same idea. The cooling can improve, we can make it smaller, more efficient, more powerful. Same with the motor.TPP: I know that the RX has three electric motors, and the third one is because of AWD? John-Paul: Exactly. Basically, you have on-demand, intelligent all-wheel drive, and it’s not the traditional, mechanical one you would find in conventional gasoline vehicles. It’s an additonal electric motor that’s mounted on the rear axle. Normally AWD vehicles will take a fuel economy penalty because you have that extra power, so if we can work off the electricity, you can have that AWD capability and not sacrifice fuel efficiency. The other two motors are the standard in a lot of our hybrids. TPP: With the HS, is that something that would replace the need for an ES hybrid? John-Paul: Not necessarily. With the HS, we’re going after a specific target. We found in our research that 60%, roughly, of entry-level luxury buyers would consider a hybrid if there was one available. That’s why we came out with this, for that segment of the luxury market. We’ve committed to basically spreading hybrid technology throughout our lineup in the coming years, going into the next couple decades, so that’s to say that this would take the place of an [ES hybrid], it’s just a matter of which one comes out first. With the ES, there’s always the possibility of it having a hybrid option. TPP: Is this HS [at the Auto Show] the production model? John-Paul: No, that’s not the exact production model. It’ll probably be pretty close. TPP: There’s been some question about the front grille, do you see that making it to production? John-Paul: That, I don’t know. Like I said, it’s probably close to what it would be in production. We won’t know that and some of its key features until [the HS is released]. You never know. My thanks to John-Paul for taking the time to speak with me, and also for showing me the Remote Touch system, which is the subject of my next post.